The previous post looked at how the above painting, the ‘Deposition of Christ’ transformed Raphael’s career and constitutes his breakthrough painting. Striking features of this painting are the way the figures seem to be struggling with a greater weight than they can easily carry, and that the figures seem to be in a state of ‘suspended animation’, frozen in the middle of action. This article will argue that these traits are neither accidental nor the result of some mystical notion of genius but were carefully planned using mechanisms designed to produce these characteristics. As mentioned in the previous post, Raphael had previously created paintings that had a static, tranquil balance, as when objects of similar weight are placed equidistant from a midpoint. In this painting Raphael uses a technique of dividing his canvas in order to both put more emphasis on certain areas of the painting whilst at the same time balancing it out. To demonstrate, I’ll use a square whose sides are 1m. If we draw the diagonal of the square then we’ve split it into two equilateral triangles whose hypotenuse will, according to Pythagoras’ theorem, be the square root of 2, or roughly 1.41m long. The next step is to divide this line into one part whose length is identical to that of the sides of the square, and another part that is the remaining 41cm length. The easiest way to do this is to swing a quarter-circle between the two corners not used for the diagonal, therefore giving a consistent radius of 1m from whichever end of the diagonal was chosen to be the notional centre of this quarter circle. We can immediately see that the top of the square passes through the eyes of the youth, that of the older man Nicodemus, and the younger man by his side John the Baptist. If we were to continue the line to the edge of the painting it would go through the eyes of the highest woman in the subsidiary scene. The vertical goes right down the back of the youth’s neck, through Jesus’ toes, and through the youth’s heel. Raphael uses the intersection of diagonal and quadrant arc to place the back of the athletic youth’s head. The main action of the scene takes place in the smaller square, whilst the remainder of the canvas is used for a subsidiary scene involving Jesus’ mother fainting, and for a background landscape. By this technique Raphael puts emphasis on his main subject, the carrying of Jesus’ body, whilst giving his painting balance through the remainder of the painting that has an equal area to the smaller square. Raphael has moved beyond the static balance of his ‘Madonna del Baldacchino’. Instead of putting the action in the square-shaped section and using the remainder to balance it, Raphael puts the main action in the L-shaped section and balances is out with the riot of primary-coloured legs in the square section. 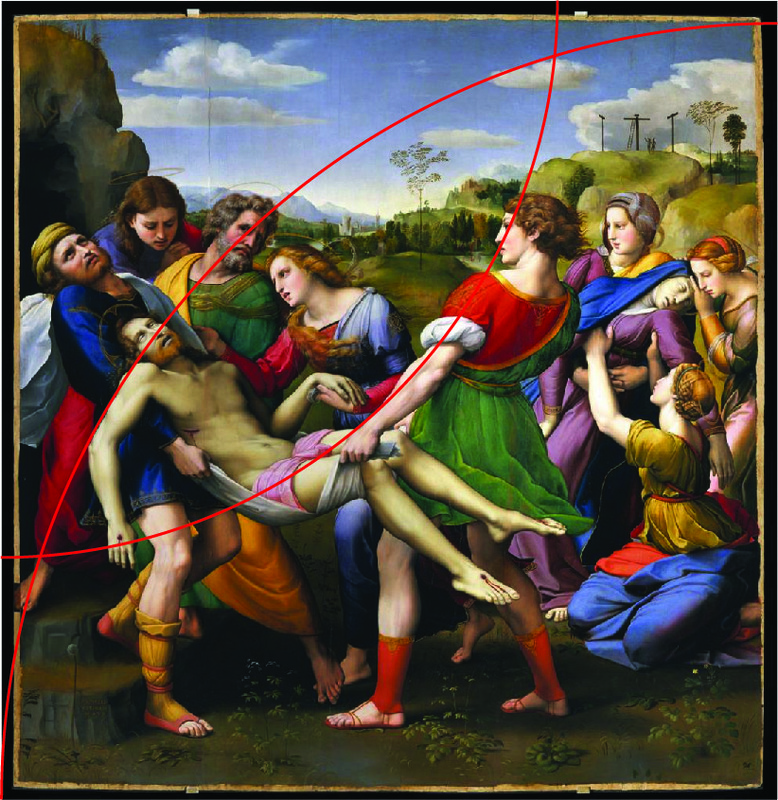 Note also that Jesus’ hand seems to be ‘resting’ on the top of the square, that the vertical goes straight through the middle of the athletic youth’s leg (the dominant vertical in the painting) and the arc goes right up his other leg, touches the end of Jesus’ right foot, precisely follows the line of Jesus’ left achilles’ heel and mirrors the curve of his hand. This is surely no accident: Raphael is using the geometry of the square to divide the canvas in order to give his painting balance. I’ll go on to tell you some of the secrets of how he created the painting’s sense of weight, its sense of bodies struggling to cope, and its sense of suspended animation, but first a little secret of my own. As very observant readers may have noticed, the canvas isn’t precisely square. It is 184 x 176 cm, just 4.5% taller than it is wide. Maddeningly, it seems to have been cropped, as can be clearly seen at the left margin which includes the toes of St. John the Baptist. There is, then, a small difference in the position of the arcs depending on which corner is chosen to swing the arc from. I could make add a few centimetres to either end to make it square, but I do not know if each side has been evenly cropped, whether anything has been cropped from top or bottom and I have one compositional reason to believe that the crop might have been approved by Raphael even though it was designed on a larger square, so I will use the canvas as is. I hope to prove to you that to an extraordinary degree his composition uses geometry derived from a square canvas. But in any case, it is the relationships and alignments between elements of the canvas that are most important, and these can be viewed independently from how they relate to the geometry of the canvas as a whole. With that said, on we go. In many civilisations across the world artists have believed that certain geometric relationships, most famously the ‘golden section’, have aesthetic properties, and that using these relationships to divide up a canvas can produce subliminal harmonious effects. Raphael uses simple geometry to generate various horizontal divisions in his canvas, and therefore rectangles within the square design. These rectangles, used in art since at least the Ancient Greeks, are all what are called ‘root rectangles’, i.e. 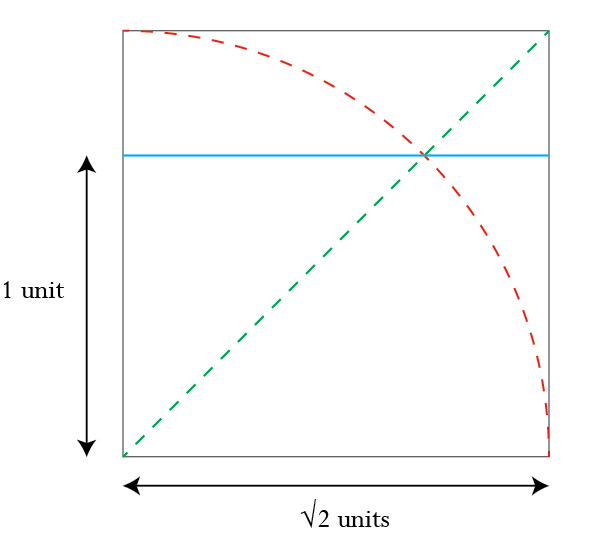 where the ratio of the short side to the long side is 1: √x, where ‘x’ is an integer. 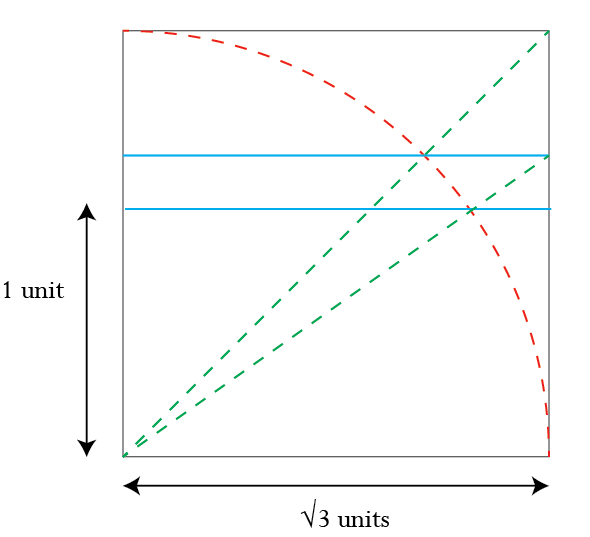 The commonly used root rectangles are 1: √1 (a.k.a. the square), 1: √2, 1: √3, 1: √4 (a.k.a. the double square) and 1: √5. There is a simple way to find these root rectangles within a square, as also explained by this video, which uses the quadrant arc that we drew to find the larger square within the canvas. The rectangle formed by the blue horizontal line and the other three sides of the square is a 1: √2, or ‘root 2 rectangle’. The hypotenuse of this rectangle will equal √3 units, as per Pythagoras’ theorem. If we draw this hypotenuse and again draw a horizontal line where it meets the quadrant arc to create a rectangle then the relationship between the height of this rectangle to its length will be 1: √3. 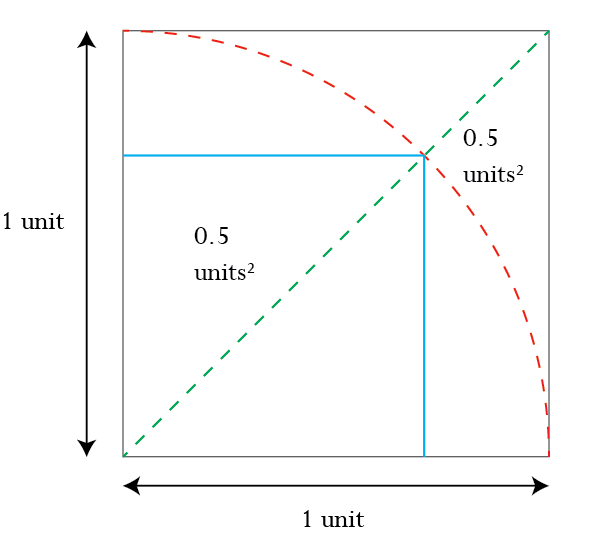 If we take the height of this new rectangle to be 1 unit then the hypotenuse will be twice its length (√4 units). Just as the uppermost line has a theme in that it passes through the eyes of many of the figures, the lower lines in this sequence also have a common theme: they support many of the joints that are bearing the weight of the two non-conscious bodies, the dead Jesus and his fainting mother. For example, the second line down passes through the shoulder of the left-hand bearer of Jesus, the shoulders of the woman tending him (Mary Magdelene), the prominent white part of the right-hand bearer’s clothing and the place where the swooning body of his mother is supported by the hands of the seated woman. The third line down passes through the left-hand bearer’s elbow, Jesus’ shoulders,his raised wrist, the elbow of the right-hand bearer and the hands clasped around the Madonna’s waist. The fourth line down runs through Jesus’ left elbow, his right-hand bearer’s wrist at the point where it intersects with the main diagonal of the canvas, the elbow of the seated woman and the base of her head. By putting these crucial points on a rhythmic succession of horizontals Raphael emphasises their stability, and by extension the bearers’ support of the deadweights of Jesus and Mary. The top line goes through Jesus’ armpits, the hand of Mary Magdelene that supports Jesus’, the waists of his bearers, the base of the hands clasped around the Madonna’s waist and the waist of the right-most woman. The second line goes through the knee of St. John (the red leg), Jesus’ right elbow, the hand of the left-hand bearer, the line of Jesus’ lap, the fingers of the right-hand bearer and the shoulder of the seated woman. The third line goes through the ankle of St. John, both knees of the left-hand bearer, the yellow-clothed knee of Nicodemus (note the two men’s knees coincide with the intersection of the arc and the main diagonal, which probably not coincidentally is just below Jesus’ centre of gravity), the knees of the right-hand bearer and the lap of the seated woman. In addition to defining the heel of Mary Magdalene, the bottom line runs along the base of the seated woman’s leg and along the cloth to its right. 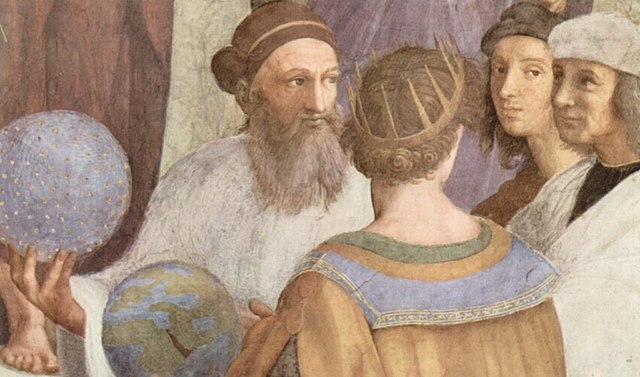 As we will see, Raphael has a particular reason for emphasising this section of the canvas. Numbering the lines from the left, Line 1 goes down the left-hand bearer’s arm, and down St. John’s thigh. Line 2 goes down part of the background rocks, down the left-hand bearer’s left shoulder and his right leg down to the heel, via Jesus’ shoulder and armpit. Line 3 goes down Jesus’ left shoulder through his centre of gravity and along the line between two knees. Lines 4 & 5 define the width of Jesus’ wrist, the gap between the white cloth held by his bearers and the width between Nicodemus’ ankle and his toe. Line 6 defines the side of the highest woman’s face and the front of the seated woman. Line 7 goes down the line of Mary’s eyes and the dividing line between light and dark on the seated woman’s neck. Line 8 defines the back of the seated woman. Through emphasising the vertical along all these lines and more Raphael gives his painting a sense of weight pushing down towards the ground. There are so many of these emphasised verticals that they outweigh in importance the stability-giving horizontals we looked at earlier, and this gives Raphael a design problem. So much weight, not enough support: how can he compensate for this lack of balance in order to give his painting as a whole a sense of balance? The answer is that he uses additional geometry based on the arc to give the sense that the additional weight is swinging upwards. 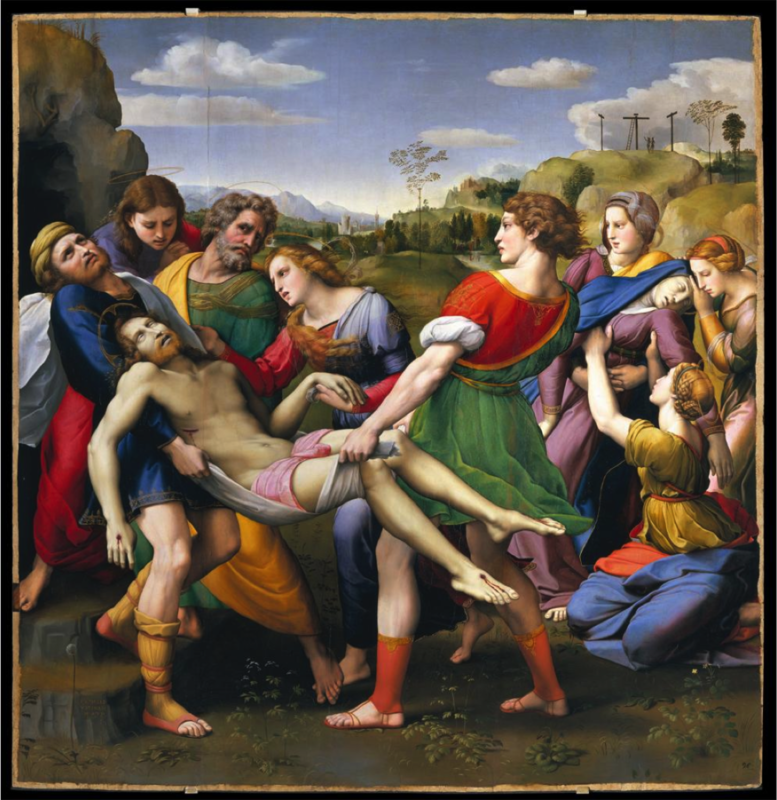 This Raphael does in two parts, one for the main group involving Jesus, and the other group with his fainting mother. If we look at the curves formed by the heads of the people tending to Jesus and that formed by Jesus’ body and the front arms of his bearers then we notice they form a cats-eye shape. This kind of shape is easily generated where arcs cross each other, and in this section we’ll see that this is what Raphael has done with his Jesus grouping. A quadrant arc derived from the base of the larger square that splits the canvas into two equal areas passes along the right-hand bearer’s back leg, along the line of Jesus’ achilles heel and defines the necklines of Mary Magdelene and Nicodemus. 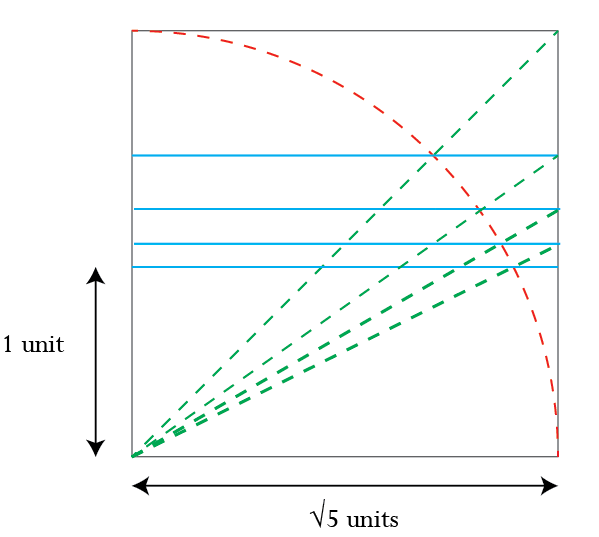 A quadrant arc derived from a vertical taken from where the next horizontal down (i.e. the √3 rectangle) intersects with the first arc we drew passes along the front of the seated woman’s knee, along the line of the right-hand bearer’s fluttering clothes, along the hairline of Nicodemus and the crown of St. John. Between these two quadrant arcs fall the faces of Mary Magdelene, Nicodemus and St. John. We can complete this cats-eye with the main quadrant arc drawn using the top-right corner of the canvas as its focal point. This swings down the arm of the left-hand bearer, down his thigh to his knee and along the lower leg of Nicodemus, as below. Well, how does this cats-eye suggest a sense of weight swinging upwards? It doesn’t, by itself. Given that we tend to ‘read’ a picture from left to right (just as we would do with text) it suggests weight falling from top-left to bottom-right. But Raphael has designed another cats-eye in that grouping that in conjunction with one more piece of geometry doessuggest a swinging upwards. We found the lower √2 rectangle by drawing a horizontal line from where the arc whose focal point is the top right corner intersects with the main diagonal. Drawing a quadrant arc from the left edge of this horizontal arcs through Jesus’ hand, the brightest coloured and protruding part of his loincloth, along the right-hand bearer’s hand and through his eye. The arc is parallel to the line of his nose and forehead. We can complete this cats-eye by using a quadrant arc that uses the bottom right corner as its focal point. This arc runs up St. John’s leg, along Jesus’ trailing upper arm, through the centre of his head, bends in the same direction as Nicodemus’ head and passes through his eye. The bottom half of this cats-eye is filled with bodies; the upper half curiously empty except for a disproportionately large tree, several times the size of its surrounding trees. This tree may be slender, but it is heavy in symbolism. In Christian symbolism ‘the Tree’ often means the Cross on which he died. The landscape in the background can therefore be seen as a symbolic triptych with the Crosses on the right, the tomb on the left, and the flourishing tree symbolising renewed life in the middle. The outsized tree that Raphael has used to fill up the upper part of this cats-eye thus symbolises the destination Jesus is going towards according to the Bible. We thus have two cats-eyes, one from top-left to bottom-right containing almost all of Jesus’ body as it falls to the ground; the other from bottom-left to top-right, containing half of Jesus’ body and intimating a return to life and eventual ascension into heaven. So, how does Raphael reconcile the two scenarios implicit in his two cats-eyes? How does he suggest that the present death will turn into the future new life? Before we address these questions, note the compositional difficulties Raphael gets into in order to create these cats-eyes, particularly with regards to Nicodemus, the figure in green and gold. In order to play his part in creating both cats-eyes he needs to bend his leg strongly to the right, and also bend his upper-body to the right, with the result that he looks bent like a banana. The big risk here is that Nicodemus will look completely implausibly balanced. This is a big risk, as risky as the method Raphael uses to try to prevent this. This method is to suggest that the right leg of St. John, in red, may be Nicodemus’ other leg and thus be able to balance out Nicodemus’ posture. Raphael does this partly by aligning that leg with the bend of Nicodemus’ upper body, making it seem like a continuation of that body and thus a forming a pyramid with the other leg in gold; and partly by his use of colours. Nicodemus’ leg is yellow, it is adjacent to a blue leg, and thus subliminally we look for the third member of the primary colours to balance these two out. Because the red leg forms a geometric, triangular, partnership with Nicodemus’ leg and his upper body, and because it forms a colour relationship with his other leg and the rather more clearly defined pair of legs in blue in front, at first sight you could be forgiven for thinking that the red leg belongs to Nicodemus and that therefore his posture may be relatively stable. The risk in Raphael’s remedy for the problem of Nicodemus’ posture is that the primary colours are too distracting. 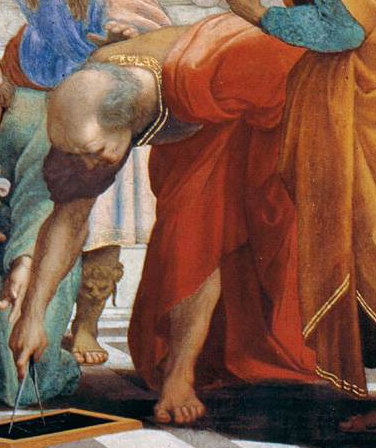 As we saw at the start of this article with Raphael’s division of the canvas into differently shaped sections of equal areas, he needs the small square that contains these primary-coloured legs to balance out the action in the L-shaped section of equal area. So on the one hand, he needs to make the colours bright to give the area importance, but on the other hand making them too bright may call attention to the compositional problems he has, and the difficulty of working out which leg is whose. It’s possible to debate whether he has done this successfully or not. But back to Raphael’s problem of how he reconciles the two cats-eyes. He does this by suggesting a turning movement between them, and he suggests this via the alignment of Jesus’ legs. The position of the legs are related to each other in that their directions radiate from a common point like spokes on a wheel, that of the top-left corner of the upper √2 rectangle. From this point, a line going along Jesus’ right leg connects with the bottom-right corner of the canvas; from this point, a line going along Jesus’ left leg connects with the intersection of the canvas edge with the horizontal line we earlier derived from the intersection of the midpoint of the canvas with the quadrant arc whose focal point is the canvas’ top-right corner. The meeting of this horizontal line with the edge of the canvas is emphasised by the cloth on the floor below the seated woman. Well, even so, two lines radiating from a common point are not enough to suggest movement. You normally need at least three. Unless Jesus is going to sprout an additional leg it at first sight looks unlikely that Raphael can achieve this. Yet look closely at the way the bottom of the right-hand bearer’s clothing billows out, the only piece of clothing to do so. The fold beside Jesus’ left foot is shaped just like the top of a foot! The second fold of his clothing reinforces this rhythm, and with it the sense of turning. With these devices, then, Raphael implies a movement from one cats-eye to the other, and from present to the future. Raphael creates an upward swinging effect in the group supporting the swooning Madonna through the use of circles that centre on the top-right corner of the smaller square that divides the larger one into different shapes of equal areas. A circle centred on here whose edge touches the precise left and right edges of the canvas sweeps along the left heel of the left-bearer and the top of his right foot, and defines the edge of the bright area of the seated woman’s thighs before sweeping through the clouds and along the hairline of the left-hand bearer. This relationship between the painting and the cropped canvas is why I suggest Raphael might have approved the crop. Just as the front and back of the seated woman are defined by the vertical lines we generated earlier, the other side of the seated woman’s thighs is also defined by a circle. From the same centre, a circle whose edge touches the intersection of the vertical side of the smaller square and the quadrant arc that is also swinging from left to right goes along her other side, her right arm, the cheek of the highest woman in the grouping and also the cheek of St. John. Because this circle relates to the quadrant arc that is swinging left to right it amplifies the sense of motion, and through that the sense of swinging upwards. The argument of this article is that Raphael uses geometry and a series of alignments of various elements in order to give his figures weight, some sense of stability, and a sweeping upwards that makes the figures look as if they are in suspended animation. Hopefully I have been convincing on at least some points and haven’t missed too much out, although some things still puzzle me. Whilst Raphael’s painting may be criticised on the grounds that Nicodemus and the seated woman look a bit awkward, and that the legs in the bottom left corner may be too confusing or too distractingly coloured, if successful my argument will hopefully have explained the geometric constraints Raphael was working under, which may be mitigating circumstances. 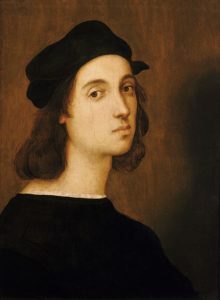 Raphael’s self-portrait, of about 1505. If I have any criticism of the painting it is that Raphael was too eager to show off by incorporating clear references to the work of Leonardo and Michelangelo (in particular the seated woman who is so reminiscent of the latter’s ‘Doni Tondo’) instead of finding other, more graceful solutions to the compositional problems presented. Yet this burst of egotism in seeking to prove that he could compete with Leonardo and Michelangelo is forgivable in someone bursting with talent but frustrated by his lack of a breakthrough, and it is notable that in perhaps his greatest work, ‘The School of Athens’, he puts both Michelangelo (Heraclitus) and Leonardo (Plato) literally front and centre, whereas he hides his self-portrait in a crowd in the periphery. Raphael hiding in the crowd in ‘the School of Athens’ with a very similar pose to that of his earlier self-portrait. This self-portrait, so similar to the one he painted whilst creating the ‘Deposition of Christ’, may possibly even be his way of atoning for his earlier impudence. In any event, I hope I’ve made the case that Raphael’s ‘Deposition of Christ’ is an extraordinary work of art by someone working under a high degree of constraints and working with ingenuity to make his figures look as graceful and natural as he could. Although when first produced it amazed Florence, the painting does not have as high a standing today. Hopefully if successful this article will have convinced you that whilst it may not be perfect it is an astonishing painting. The video drawing course taught by Myron Barnstone, which includes many of this type of interpretations. The book ‘Dynamic Symmetry’ by Jay Hambidge, which explains the geometry used by many artists throughout history. Last but not least, there’s ‘The Painter’s Secret Geometry’ by Charles Bouleau, which analyses the underlying geometric forms of dozens and dozens of paintings through many centuries.